The endoplasmic reticulum (ER) is a series of interconnected membranes or flattened sacs adjacent and connected to the nuclear membrane. The ER comes in two different morphological forms: smooth endoplasmic reticulum (sER) and rough endoplasmic reticulum (rER). The primary function of the sER is to serve as a platform for the synthesis of lipids (fats), carbohydrate (sugars) metabolism , and the detoxification of drugs and other toxins. Tissues and organs that directly participate in these activities, such as the liver, are enriched in sER. Morphologically, the rER is studded with ribosomes that participate in protein synthesis giving its "rough" appearance when viewed with the electron microscope. The proteins synthesized on the ER are transported from the ER membranes by small vesicles that pinch off the surface and enter the Golgi membrane stack (cisternae). From the Golgi, the proteins are transported to the cell surface or to other organelles . The rER is a series of stacked membranes closest to the nucleus that is the site for synthesis and maturation of proteins destined for the plasma membrane, secretory vesicles, or endocytic vesicles. Many ribosomes stud the cytoplasmic face of the rER, as well as populating the surrounding cytoplasm. Messenger ribonucleic acid (mRNA) transcribed in the nucleus leaves the nucleus via the nuclear pores and is transported into the cytoplasm. Docking sites on the head or "N-terminus" of the mRNA allow the ribosome to bind to it and initiate translation , decoding the linear sequences of bases in the RNA to an amino acid sequence that will constitute a protein. Translocation into the Lumen. The first segment of the growing peptide consists of a "signal sequence" that binds to a pre-existing signal recognition particle (SRP) from the cytoplasm. The SRP is a small protein/RNA complex that acts as a targeting guide and is essential for protein translocation into the rER lumen (interior chamber). The cytoplasmic surface of the rER contains a protein called the SRP receptor that binds to the SRP, anchoring the ribosome with its growing peptide to the rER membrane. As translation proceeds, the peptide is fed into the lumen of the rER where the signal sequence is cut off and additional changes called post-translational modifications proceed immediately. Glycosylation. Proteins are modified by the addition of carbohydrates (glycosylation) to specific amino acids in the peptide chain. One of the most common modifications is to attach an oligosaccharide ( oligo means "few"; saccharide means "sugar" or "carbohydrate") to the growing peptide. The branched oligosaccharide is composed of a combination of three sugars: glucose, mannose, and N-acetylglucosamine that can be further modified in the rER and, later, in the Golgi complex. The oligosaccharide modifications on proteins assist in the correct folding of the protein and help stabilize it. The oligosaccharide may also assist in targeting the protein to the correct location in the cell. Protein Folding. The ER lumen maintains a chemical environment that ensures that proteins are folded into the correct conformation . Misfolded proteins are useless and may cause problems if they are detected as "foreign structures" by the immune system of the body. How does the ER ensure that proteins are folded correctly? Newly synthesized proteins are quickly associated with ER "chaperone proteins" and folding enzymes that assist in the folding of the proteins into their correct conformations. A protein that is misfolded is retained by the ER and degraded. It is not known exactly how the ER recognizes misfolded proteins, but it may be able to recognize specific domains or segments on the proteins. For example, a hydrophobic domain (water-avoiding segment) should be tucked away inside the protein, but a misfolded protein may have this domain protruding outward. Such a protein would be retained and degraded. Lipid synthesis takes place at the interface of the sER membrane and the cytosol . The initial starting material is embedded in the membrane while cytosolic enzymes and building materials continually modify it until the lipid product is complete. How do these lipids, which are made in the sER, get to the plasma membrane or other organelle membranes? There are two models. According to the membrane budding model, a patch of membrane pinches off the ER and forms a vesicle that finds its way to its destination. 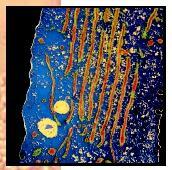 Rough endoplasmic reticulum in an animal cell. The ER membranes are seen running from the top to the bottom of the image. The small granules attached to the membrane of the ER are ribosomes. In the phospholipid exchange model, water-soluble proteins remove the lipid from the ER membrane and release it into the target membrane. The ER is also involved in cell signaling by releasing stored calcium ions (Ca 2 ) into the cytosol. This serves to amplify signals from molecules in very low concentrations, such as extracellular hormones , thus triggering a response in cells. Without amplification of the initial signal, the cells will not respond to the hormone. The chain of events can be summarized as follows: (1) a hormone binds to a specific receptor on the plasma membrane; (2) the receptor interacts with several other membrane-bound signaling proteins to produce a molecule called inositol 1,4,5-trisphosphate (IP 3 ), which is released into the cytoplasm; and (3) IP 3 interacts with its own receptor on the ER membrane and passes the signal on to a Ca 2 pump. Once the pump is activated, it releases a massive amount of calcium from the ER lumen into the cytoplasm. The Ca 2 ions act as "second messengers" that turn on several cellular systems ranging from cell motility to protein synthesis. Ellgaard, Lars, et al. "Setting the Standard: Quality Control in the Secretory Pathway." Science 286 (December 3, 1999): 1882–1887. Lodish, Harvey F., et al. Molecular Cell Biology, 4th ed. New York: W. H. Freeman and Co., 2000. Putney, James W., Jr. "'Kissin' Cousins': Intimate Plasma Membrane-ER Interactions Underlie Capacitative Calcium Entry." Cell 99 (1999): 5–8.